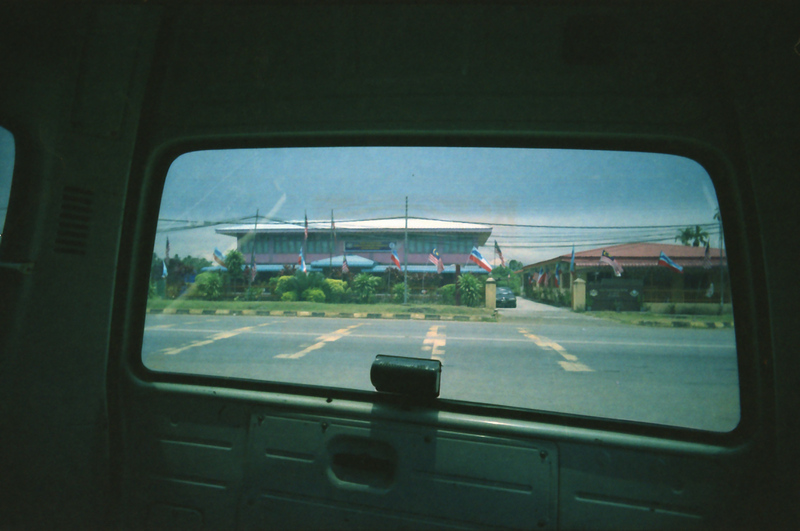 Notes From a Malaysian Road Trip | This Japanese Life. Posted on September 27, 2011	by E.
It’s understandable. Kuala Lumpur sounds like it’s from nowhere. If the words were an adjective, they might be used to describe dilapidated buildings, hand-painted advertisements for misspelled Coke knockoffs, places where chickens compete with Soviet-era sedans for space on roads. As a noun, it seems like the scene of a decisive science fiction battle in America’s nightmare war against a retro-futurist Chinese/Soviet alliance. Those words, Kuala Lumpur, clearly aren’t from a western language and lack geographical giveaways: No Chinese Ings or Korean Ongs or Eastern European Czyks. It could be anywhere outside of Morocco or somewhere east of Budapest. So, here: It’s located on the South China Sea. So it’s Asian. But hold on, guys. It’s totally Islamic. The Malaysian flag looks an artifact of the apocalypse envisioned by America’s “birthers” since election day 2008: The red and white stripes of the American flag with a single Islamic crescent where there should be 50 stars. 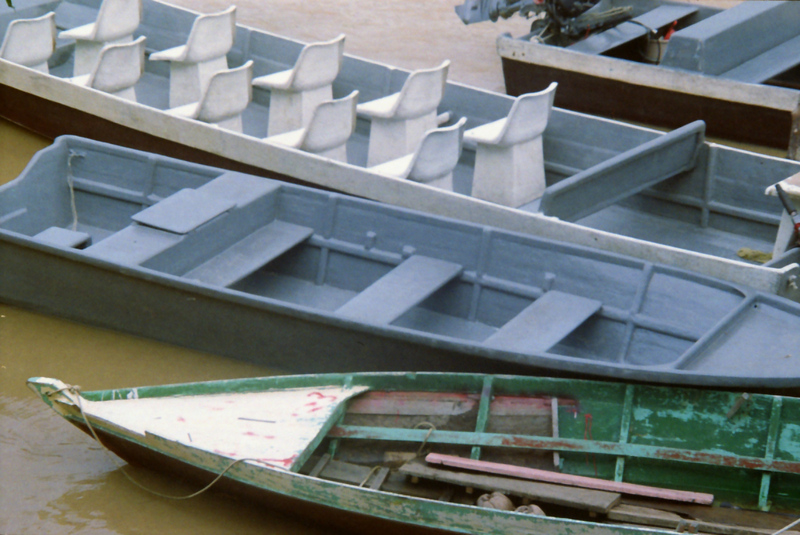 In Malay, Kuala Lumpur means “Muddy River,” which could pass as a crawfish capital along the Louisiana bayou. Rival Chinese gangs settled it in 1850, who proceeded to kill each other for access to the region’s tin mines for a couple of decades. History has offered the city such riches as a three-year Japanese occupation, then independence, then a Communist insurgency followed by burst of anti-Chinese race riots. It’s now most notorious to Americans as the planning site for the attacks on the World Trade Center and the USS Cole. Khalid Almidhar and Nawaf Alhazmi, two of the Flight 77 hijackers in the 9/11 attacks, first met somewhere in view of the city’s own Petronas Twin Towers. With its ties to terrorism, a pseudo-democratic government and heavy influence from China and Islam, Kuala Lumpur is a city built on the muddy rivers of American anxiety, an island of misfit toys run by every alternative pole of power to the US. You can see why my mom might be freaked out. Malaysia, safe to say, doesn’t care about my mom. After all, it’s doing OK. Kuala Lumpur has a sparkling masterpiece of a skyline, blending Arabic and Chinese styles with infrastructure about 15 years ahead of most American cities. Most of it was built during a manufacturing, oil and Islamic financing boom in the 1990’s that no western government could tap, just as Asian banks were spiraling into the crisis that sparked two decades of lost growth in Japan. Today, monorails take you to enormous, complex skyscrapers and abstract architectural marvels paid for by state-run oil and Islamic Banks. In boom times, the city entered the construction business in a record-breaking frenzy of inconsequential boasting, at one point possessing both the tallest and widest buildings on Earth, as well as the tallest flagpole and longest bridge. In 1997, there was so much construction in the central city that the government just started building another city 15 miles away. That growth is still high – gaining at 7.7 percent last year, despite a global economic downturn – and construction is still heavy downtown. The trains are still clean and fast, and residential neighborhoods are sparkling and clean along the way to the glowing nightlife of the city center. Downtown, macho Asian men dare you to mock them, wearing pink shirts with “NIKE” spelled out in glitter as they head to hookah bars with women in black birqas. Other men, in suits and gold chains, say “al-salaam ‘alaykum”(1) to each other on the streets, but not to me. They’re passed by Indian women in tight jeans or sarongs, raven-colored hair flowing from their skulls as they head past an Outback restaurant to the humus place. Signage is in all three national languages – Malay, Tamil, and Chinese – with English and Japanese as afterthoughts on signs for tourist destinations. Alcohol pours freely in Kuala Lumpur, in orange-and-blue cans of Tiger beer, though the tap runs dry as you go further from the city. Muslim taboos on alcohol and pork make Irish pubs in the city especially edgy. You can get beer, but don’t ask for bacon. Leaving the city is like watching a shrinking bar graph of per capita income: Wealth shrinks as you move from the glowing towers of Kuala Lumpur to the wood-and-aluminum shacks of the Malaysian countryside. At the lowest end of the graph, standing on stilts along roads connecting a never-ending stream of palm, rubber and cocoa plantations, are your typical Malaysian homes. These houses don’t have glass for windows or pipes for running water. They’re built on sticks as a form of pest control, and every home but the poorest has it’s own enormous plastic jug of water connected to the house through a plastic tube or a simple spigot. And then, every four or five homes apart, a stilted palace appears, painted pink or purple, their ornate glass windows illuminated by the flicker of a television set, evidence not just of electricity, but the time to use it. The chickens run loose in the streets, siding with kittens in solidarity against roving gangs of wild dogs whose tongues hang out in good-natured stupidity. Brief glimpses of life caught between the palm trees: A puddle where sweaty men skinny dip in water the muddy color of their tans, protective eyes watching their motorbikes; girls in headscarves slip on stones, picking themselves up with an embarrassed laugh on their way from the Indian-inspired boarding schools. In the port city of Semporna, the towers are gone. Instead, there are crumbling buildings with the word “Beauty Salon” spray painted in sloppy handwriting with an arrow pointing to a stairway. Everyone who doesn’t have a moustache has a headscarf. There’s a store that sells ice. The grocery store is inexplicably bumping the Pussycat Dolls while we search for bug spray and try to decide if the can with the rooster is a wild chicken repellent. The houses, on their stilted legs, reach out to the sea, and just past the boardwalks are rows of house boats and tiny fishing vessels. If there’s running water, I have no idea where it comes from. The speedboat driver was a quiet guy who looked like my dad, which means nothing unless your father also looks like Sonny Bono. But it mattered, because occasionally the guy would walk away from the steering wheel as we were speeding forward and I wanted to think he knew what he was doing. I spent most of my time in Malaysia looking unshaved and rugged on speedboats operated by maritime anarchists. Men held on to ropes at the front of a boat while the driver steered into waves, the boat hurtled through the air and into another wave, ricocheted and caught air again as the guy tried not to fall into the sea. When he didn’t, he whooped. 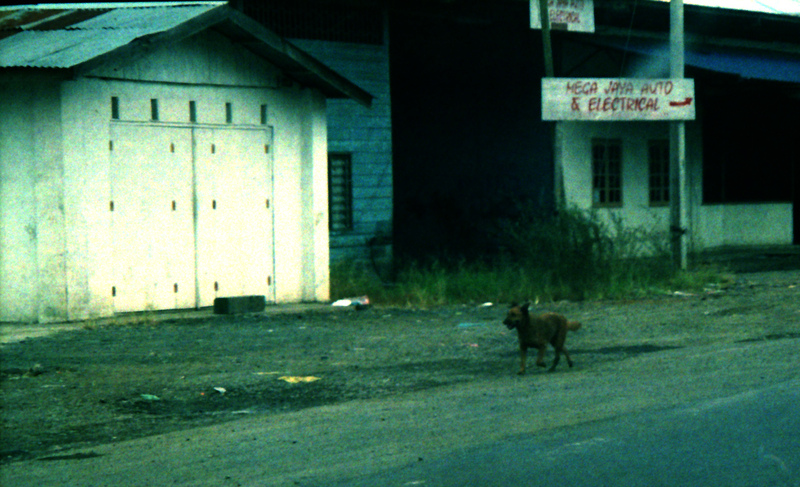 Fillipino Islamists attacked Sipadan in 2000, kidnapping 21 people (including 10 tourists). Since then, Malaysian military boats flank the Celebes Sea. Foreigners and hermit crabs frolic on white sands under the watchful brown eyes of camouflaged men with moustaches and machine guns. 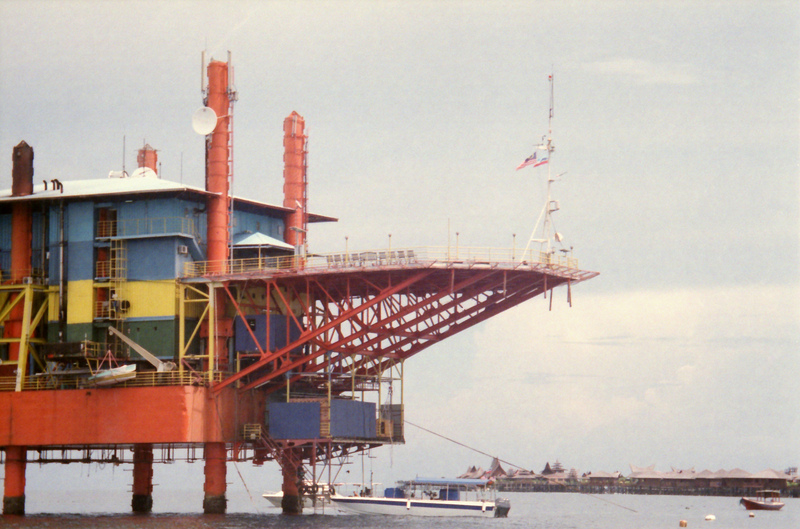 We stayed on a decommissioned oil rig about 20 miles from the coast of Borneo, a high-concept, low-budget hotel and SCUBA diving facility called Seaventures, literally standing over an artificial reef where the sea is absorbing abandoned pieces of oil machinery. In the morning the water is still as glass, and from the side of the rig the sun reflects on blue and yellow slivers of fish. 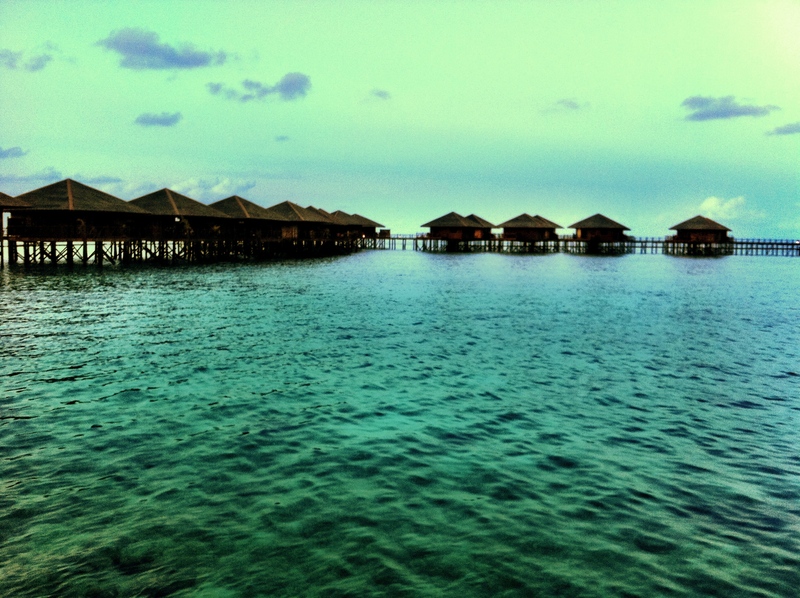 You can see Mabul Island’s high-end honeymoon resorts perched upon long walkways over the water to the left of the island, a Disneyland version of the island’s right-hand side: A shanty dock town of 1,000 Mabul Island natives selling shark’s teeth and conch shells for a living. A boat from the rig will transport you back to the land of chickens, kittens and wild dogs; but also naked babies and some clothed ones asking, in broken English, to see what’s in your bag. There were no grown beggars on the island, and the locals seemed happy to see any foreigner and conduct fair business with them. I mention this because the temptation has to be overwhelming, and the collective refusal to extract money from guilty consciences seems like a deliberate long-term strategy to get visitors to spend money on real goods being sold by native islanders. Begging, of course, isn’t good for anybody. Tourism in poor places is, of course, not great for anyone either, but we can hardly fault the poor for not keeping up better appearances for whitey on holiday. So go ahead and spend some ringgits on whatever local enterprise you can and hope that the invisible hand of the market is benevolent. I say this because the resorts all have tabs, include meals, and give you a safe deposit box to keep your passport and money in, which you won’t need again until you leave. All of this has a strange deflationary effect on the conch-shell traders and shark-teeth peddlers on Mabul proper. I would implore any visitor to Mabul Island to take along a handful of coins and see if you can’t support the local economy. In between these two sides of Mabul Island is a security gate, which no one seemed to take seriously – children crawled around in the guard’s hut as we left – but no one crossed into the resort, either. (1) Mohammad was once asked what the best part of the Islamic faith was. His answer was basically “giving food to the needy, and say hello to everyone for me.” But apparently, it’s not always cool for Muslims to give an “al-salaam ‘alaykum” to non-Muslims. This seems to offend a lot of people, but it seems no worse to me than the kind of political correctness that stops us from saying “Merry Christmas” to Jews. Tomorrow: On Scuba Diving from a Malaysian Oil Rig. If you’re interested in seeing some clips from Malaysian television, come on over to This Japanese Life on Facebook. 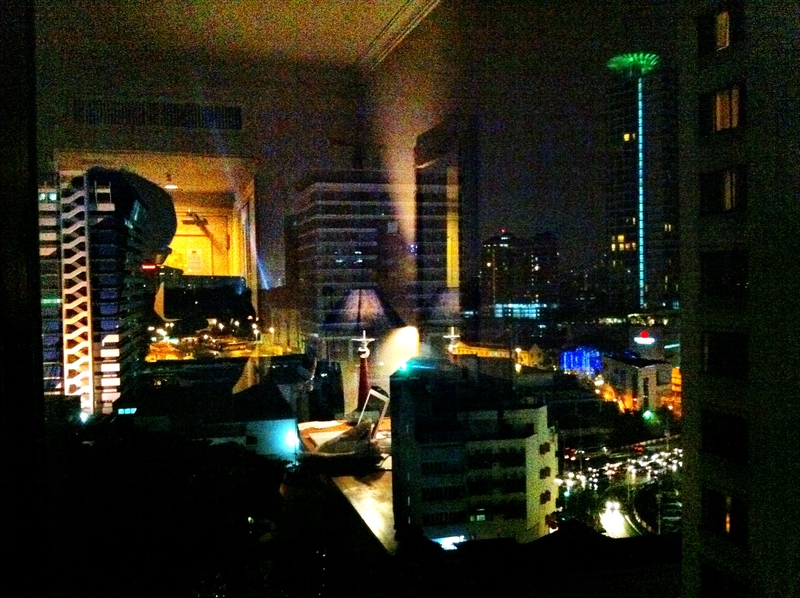 This entry was posted in Culture Shock, Travel, Uncategorized and tagged kuala lumpur, malaysia, travel. Bookmark the permalink. assalamualaikum mean may the peace be upon u. it’s kinda cool to greet non-muslim with it BUT is u gonna understand the purpose? ?